A dear friend once told me about the song “I Run For Life” by Melissa Etheridge. It has become one of my favourite running songs. It was written for women fighting cancer, but I think it applies to anyone fighting physical or mental battles. We all know the importance of exercise. We’ve heard about the benefits to our body, mind and soul. Many are also aware of the importance of exercise for people who are struggling with mental illness. It’s nothing new. But let me tell you…when your mind is against it, and someone says “Just go for a walk and you’ll feel better”, that doesn’t always help. However, if someone says “Hey, let’s go out for a walk together”, the task becomes less overwhelming. 2008 became my year of physical and spiritual transformation. I lost over 70 lbs and was invited to church for the first time. Both things profoundly impacted my life, physically and spiritually. Support from friends was crucial to this metamorphosis, for both exercising and for studying the bible. Being healthy physically, mentally and spiritually are critical. For me physically, I try to run. I’m not a “good” runner by any means, but I run. Finding a running partner has been motivating and inspiring. I run with a friend once a week, with my kids when I can, and also alone where I can have time with God. When I trained for the triathlons, I worked out with a tri club at our local Y. 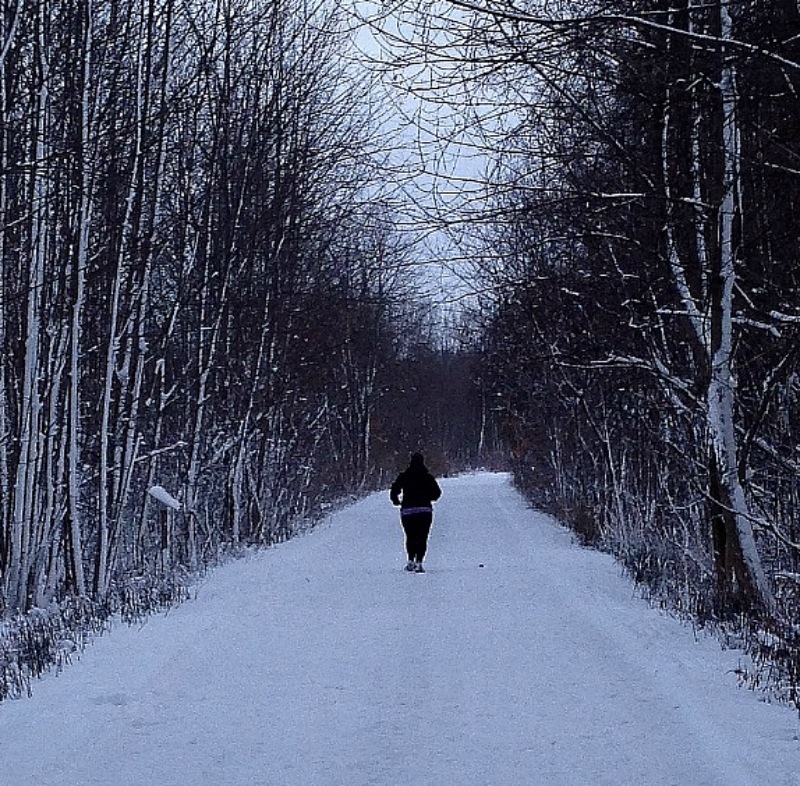 When preparing for a ½ marathon, I helped start a group for women who wanted to train together. It motivated me and held me accountable. What’s the common denominator? Support. This past weekend, there was a local race that my new running buddy and I decided to run. It’s a fun, non-competitive race series. Unfortunately, due to a crazy Canadian winter storm, the cold, snow and wind scared us off. But, as the day cleared up, we put on our running shoes and layers of clothes and went out to do our own run in the afternoon. (Pictured above is my awesome friend) It felt great and we were proud of ourselves for doing it! I have (once again!) started from scratch. I get frustrated with myself when I get off my workout routine. But it happens. And taking the first step to start is always the hardest. We never regret starting, but we always regret not starting. We are only given one body in this lifetime. To help keep healthy physically, spiritually and mentally, we need to work at it. Some days it may not be easy, but rejoice in every small step you take. And if you know someone who could use an exercise friend, offer support. Always remember, that those that think they don’t have the time for exercise, will sooner or later have to find time for illness. Do you not know that your bodies are temples of the Holy Spirit, who is in you, whom you have received from God? You are not your own. Therefore honour God with your bodies. Next PostNext Happiness: Is it really a choice?